On Wednesday 13th of February 2019 at 5.30pm, Agriculture, Countryside and Land Management Services (ACLMS) held a meeting for the Guernsey Beekeepers Association at the Yacht Club at the Castle Emplacement. 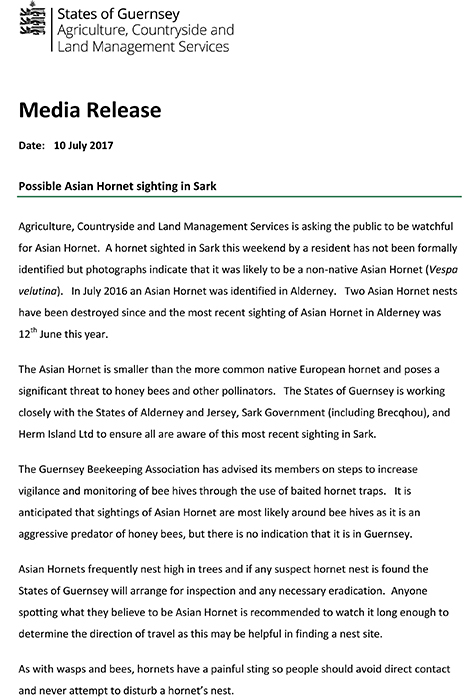 This meeting outlined the States of Guernsey’s Asian Hornet Strategy for the next three years plus explained plans for the island wide spring trapping scheme which aims to reduce the number of queen hornets and therefore the number of nests later in the year. There was opportunity to meet the new Asian Hornet Team. Francis Russell, Project Coordinator and Damian Harris, Field and Research Officer. Their roles were outlined and there was news on what they have been doing so far. ACLMS would like to thank all Guernsey Beekeepers for their help and support so far. 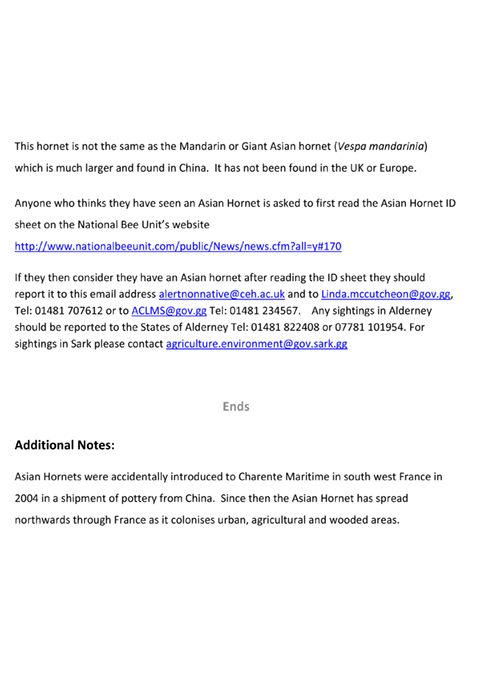 Please look at this pdf as it gives visuals of the Asian Hornet and similar insects that may be wrongly identified as this predator. If the poster can be printed out and displayed in a prominent place it will help spread the word - thank you. An Asian hornet nest has been discovered in Torteval. 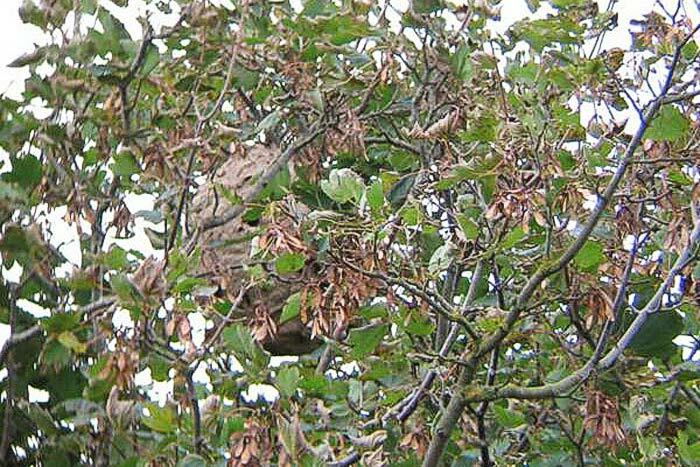 The nest is in a Sycamore tree approximately 9m above ground level, and is estimated to measure approximately 30cm across. The nest has been treated with a powder insecticide this afternoon by a professional pest controller. It will be removed from the tree shortly once the pesticide has killed any live hornets. Once removed, the nest will be bagged and frozen to kill any remaining unhatched larvae. 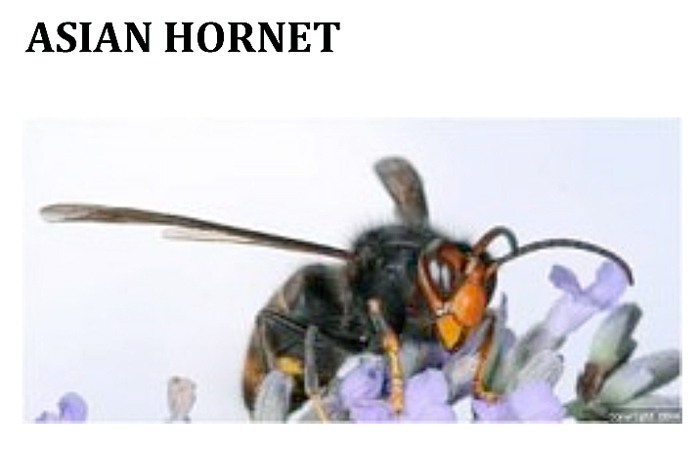 To protect public safety, the location of the nest will not be disclosed until after it has been removed, as hornets may be aggressive if disturbed. The discovery was made by Damian Harris, a local bee keeper, and has been verified by Agriculture, Countryside and Land Management Services (ACLMS). 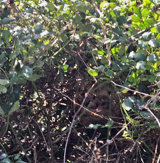 Image of Asian Hornet nest found low on ground in Brambles -- now destroyed. SEE IMAGE -- SHOWN LEFT. Three Asian Hornets which are believed to be female workers were caught yesterday at a property within about one hundred metres of the Torteval church and an abandoned embryo nest of approx 4cm x 6cm was cleared by the states from a property adjacent to the church. It was discovered in a Wendy house. The nest found was the embryo nest that the queen builds raising a few workers who then abandon this to build the larger nest high in the tree canopy nearby. Members who have bees in this area are being organised to look for this nest which will probably at this stage be difficult to find. We must not let up our search as should this nest not be found and produces Queens to overwinter then we will have a very big problem next year. So please check and refresh your traps and add the protein element such as cat meat, prawns, mashed fish etc as an encouragement. Meat, fish etc will probably need to be replaced every few days. Don’t abandon the sweet liquid entirely as the hornet gets its reward from the larvae when it returns with mashed up insects but better still if it continues to get it in your trap. The French cocktail used in traps is Biere Brune, vin blanc, Crème de Cassis or Sirop de cassis in the ratio of 2:1:.02 (500ml:250m:l50ml. Use a Ruby beer but not light ales, bitter or stout. Avoid beers with hops and burnt malt. Biere Brune is a strong sweet malt beer but whether it is available in Guernsey I am not sure. 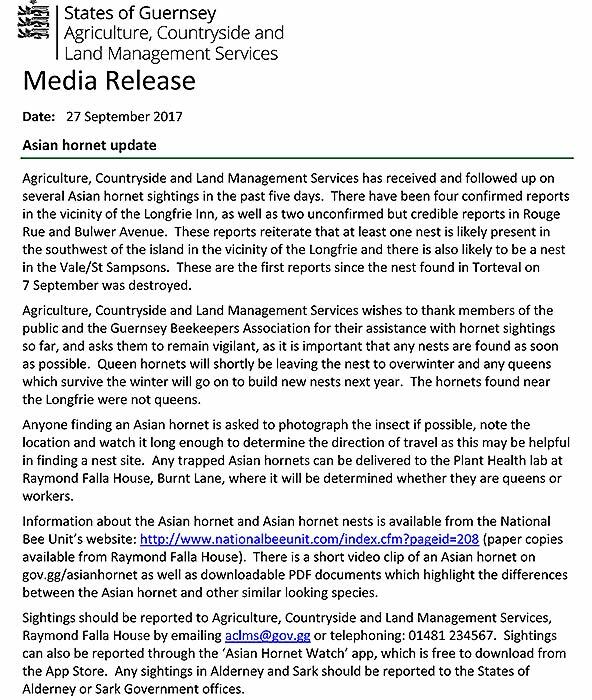 Also be vigilant and alert your neighbours and friends to the possibility of there being more hornets around the island. If they can reach Torteval they can be developing nests anywhere. The Release is shown below plus there is a downloadable pdf with clickable web addresses for notification and further information within the pdf . These are my Mark 2 Asian Hornet trap. Exactly the same as before but now the bottom of the bottle is not cut. Before inverting the neck some foam rubber or sponge is pushed to the bottom onto that I have placed the mesh. This will prevent any insects from drowning the 5.5 mm holes near the top allow other insects to escape. The top cover is a shop bought trifle container. The sponge absorbs the bate and provides a support for the mesh if added but not necessary as long as the foam is higher than the liquid. These will be a lot easier to make. July 2016, another Asian Hornet has been spotted hawking in front of a hive. UPDATE On October 23rd 2016, a large active Asian Hornets nest had been discovered 80 foot high on what looks like a Sycamore tree - (at the time of posting 24th October, discussions are ongoing on how to destroy it). Shown here is an image of the nest. There has been a possible sighting, but not confirmed at La Corbiere in Guernsey (August 2016) which is along the south coast of the island. A sizeable nest has been found and destroyed near Tetbury in Gloucestershire (September 2016). The current Bee Base News on the National Bee Unit's Website about this predator .. Being vigilant can when they arrive and trapping them can reduce the amount of queens and hence nests by 97% , this is from trials conducted in France. So please make as many traps as you need hang them in the vicinity of your hives and MAINTAIN THEM. They are a highly aggressive predator of native insects and pose a significant risk to our honey bees. They are active from from Febrary to November and are most likely to be found close to bee hives. The GBKA committee are keen to stress the importance of placing an Asian Hornet trap close to your hives and are looking at ways of providing these to members. Acknowledgement to use the last PDF goes to Ivor Flatman of 'The Food & Environment Research Agency, who designed the trap and wrote the document.